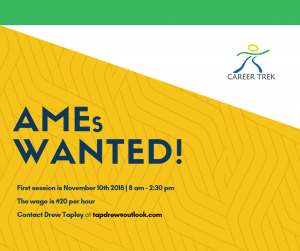 Career Trek is hiring! They are looking for motivated and enthusiastic AME grads or second-year students who are available to work on Saturdays with youth in grade 6 to do hands-on activities related to aviation/aerospace. There will be 4-weekend sessions for the 2018-2019 school year.